Last summer I wrote in this newsletter about teaching birding in under served New York City public schools, grades 2- 5 in a program called For the Birds sponsored by New York State Audubon. 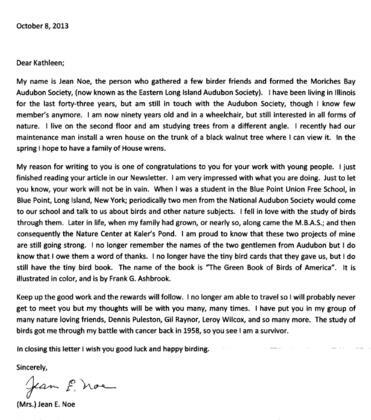 Shortly afterwards, Sally Newbert, newsletter editor, received a letter from Jean Noe, the 1967 founder of Moriches Bay Audubon Society (now ELIAS) and the Kahlers Pond Center. In the letter (which delighted me) Mrs. Noe praised the work of For The Birds, recounting visits by Audubon staff members to her school to teach about birds in 1934 to 1936. Subsequently, birding became her passion and avocation. She had received this newsletter via her son Bill in her retirement home in Elgin, Illinois, 40 miles northwest of Chicago. When I learned of the letter, I spoke with Mrs. Noe and told her and that I would try to meet and interview her after the winter thaw. She told me not to wait too long because she was 91. Quite often, I think about my own students and wonder whether some of them will become birders or at least appreciate nature. Now, perhaps I had an opportunity to find out how Mrs. Noe’s early introduction to birding brought on her passion in her adult years. So, along with my husband, Clary Olmstead, and one of the founders and lead teachers of For The Birds, Wendy Paulson, now living in Barrington, IL, I visited Mrs. Noe in late June. Mrs. Noe and her 12 classmates were the beneficiaries of a program similar to For The Birds (FTB). It too was sponsored by Audubon. When she was in grammar school in the Blue Point Union Free School, two or three times a year during 1934 to 36 one or two men who worked with Audubon came to her school. “It was something we absolutely loved.” What Mrs. Noe remembers most was their efforts “to discourage anybody from destroying (the birds).” The students were given bird cards (Wendy thought they might be the sets of cards produced by Arm & Hammer Soda with a bird photo on one side and a description on the flip side). 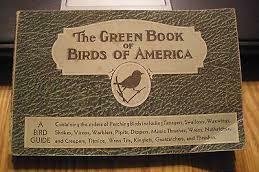 They also were given “The Green Book Birds of America”, one of a set of three books. Mrs. Noe’s son had ordered one of the books on Amazon and they presented it to me. The 3”x 3” paperback book has pictures and flowery descriptions of about 60 birds. Later, while living in Center Moriches with her husband, Bill, and her four children, three boys and a girl, she and four of her women friends formed a bird club. “We started out as a group simply sharing our sightings and had a good time.” This group of women, Carol Tveekrem, Ethel Havins, Marcella Borgart and Ida Johnson, at the suggestion of Mrs. Noe, decided to become an Audubon chapter. 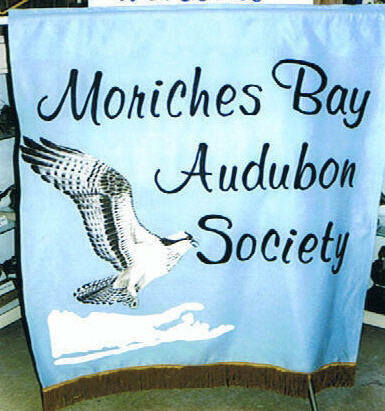 As a result, in 1967 Moriches Bay Audubon Society was formed. Membership started with five people, but quickly grew to 300 members. The year before, Roy Wilcox had taught an adult class in ornithology in Westhampton which contributed to the rapid membership growth. Mrs. Noe obtained the class list and called the participants encouraging them to join. Mrs. Noe proudly said, “We were an active chapter with a newsletter.” Meetings were held once a month starting at the Center Moriches Library. Jerry Donnelly, the librarian, was an Audubon member. But soon the membership became too large for that space, so the meetings were moved to the local school. Later, after Mrs. Noe departed for the midwest in 1971, meetings were held at the the Quogue Wildlife Refugee and still are. Once a week they had a field trip. People like Roy Wilcox were guides. Mrs. Noe never was a guide. In 1971, Mrs. Noe left Center Moriches to live in South Elgin. “I did not want to leave Center Moriches for the midwest because I knew I would miss the Moriches Bay Audubon Society.” However, not surprisingly, Mrs. Noe became active in the local Audubon Society In Elgin. Nearby, in Lord’s Park, there was a museum that had many mounted birds which were mislabeled. Mrs Noe’s proposal to correctly identify them was turned down. For two years she did the local Audubon newsletter. She remembered longingly about how pro-active she and her friends had been in the Moriches Bay Audubon Society. Mrs. Noe, now a widow, will be 92 in February. Her mobility is restricted but her mind, spirit and sense of humor are still excellent. She received permission to have a bird house suited for wrens installed on a black walnut tree outside her second floor window. There have been no takers so far, but she is hoping that perhaps a White-breasted Nuthatch or a Chickadee will take up residence. Wendy explained that the male wren often builds three or four nests from which his female may choose one in which she will lay her eggs. Mrs. Noe chimed in that the female then raises the chicks by herself while the male goes a courting again. Mrs. Noe told us a few good stories about birding on Dune Road. She and Carol Tveekrem were out east on Dune Rd. one day when they spotted a Snowy Owl on a telephone pole. The bird was stretching out his wings as he perched high above them. Suddenly, he took off outstretched in all his glory. Wendy and I were inspired by Mrs. Noe’s life long interest and work in birding. We were especially pleased to learn of her childhood introduction to birding by the Audubon Society some 80 plus years ago. We each will be looking for a future Mrs. Noe in our respective classes this coming year. Wendy, along with 28 other volunteers, will teach birding in a three year old Chicago based program, Birds in My Neighborhood, sponsored by Chicago Audubon and Open Lands. They will be in 17 schools, all located near parks. I will return to my school near Van Cortlandt Park where I will be on the lookout for potential life long birders. Right now, I’m thinking of four boys in the three classes I taught in this past school year. There was Jackson who brought in a Phoebe’s nest found under the porch at his grandparents’ house, Christian who spotted two red-tail hawks circling in the sky as he sat in the classroom, and the two best friends who told me that they, “birded every day,” one of whom identified two Baltimore Orioles and the other of whom led me to an active robin’s nest on a field trip in Central Park. 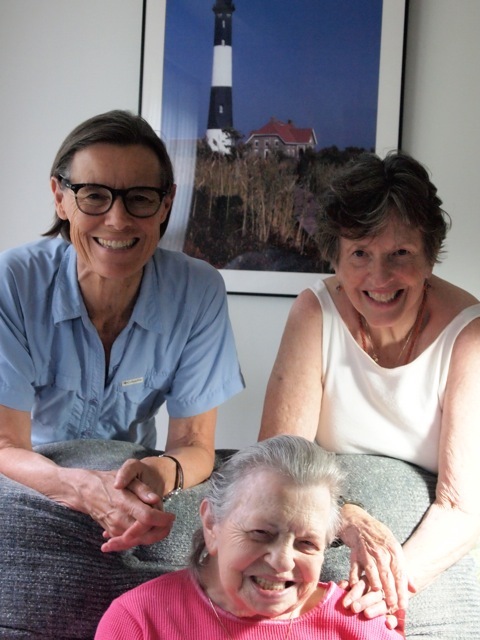 "From the Barrens to the Bays"
Eastern Long Island Audubon Society, Inc.
Jean Noe, seated between Wendy Paulson, left and Kathleen Heenan. Wendy and Kathleen visited Mrs. Noe in Elgin, Il in 2014. The letter that Mrs. Noe wrote to ELIAS that prompted this article. The Green Book - Birds of America given to students by Audubon in the 1930's to help them learn about the birds. It is, or was, still available on Amazon. Will, Jackson, one of the students in Kathleen Heenan's classes, become a life-long birder? 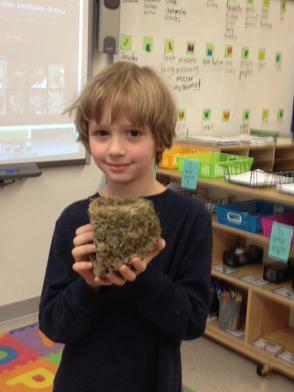 He brought in a Phoebe's nest that he found under his grandparent's home. He and his friend go birding every day.